Even if you never consciously think about it, this is probably the most-used item in your shower—but have you ever cleaned it? Knowing how to clean a shower isn’t an optional part of housekeeping. Everyone showers or bathes, so everyone should know how to clean that bathing spot, even if it’s a quick wipe-down every few weeks. (Self-described neat freaks will cringe, but that’s definitely better than nothing.) But even the best shower cleaner can’t get the space completely spotless if you’re not cleaning every part of it. Think about it: When was the last time you washed the shower head or shower curtain? Learning how to clean a shower curtain is actually pretty easy. All you need to do is throw the shower curtain and liner in the washing machine, with a large bath towel (or a few) for scrubbing action, according to the pros at residential cleaning company Molly Maid, a Neighborlythis company. Add detergent and wash the load on gentle, then hang dry (or throw in the dryer for just a few minutes). It’s that simple. Of course, cleaning a shower curtain is pretty uncommon. Many people purchase inexpensive curtains and toss them when they start to look dirty, or they move homes so often (buying a shower curtain with each new bathroom) that it’s not necessary. How to clean a shower head is, ironically, likely the more pressing skill to learn, and probably the one fewer people are familiar with. Follow these tips from the Molly Maid team to clean your shower head ASAP, and your next shower may feel like your cleanest ever. Fill a plastic bag partway with white vinegar. Be careful not to overfill the bag, as it could overflow when you submerge the shower head. Place the bag over the shower head until the entire fixture is immersed in the vinegar. If you need to adjust the vinegar level, do so now. Fasten the bag with a piece of string or twist ties wrapped around the neck of the shower head. Carefully test how secure the bag is to make sure it won’t slip once you let go. Let the shower head soak for several hours. For an especially dirty fixture, leave it overnight. If you have a brass, gold, or nickel-coated shower head, remove it from the vinegar after 30 minutes, as any longer than this could damage the finish. Untie the bag and remove it from the shower head. Tip the bag and let the vinegar run down the shower drain. 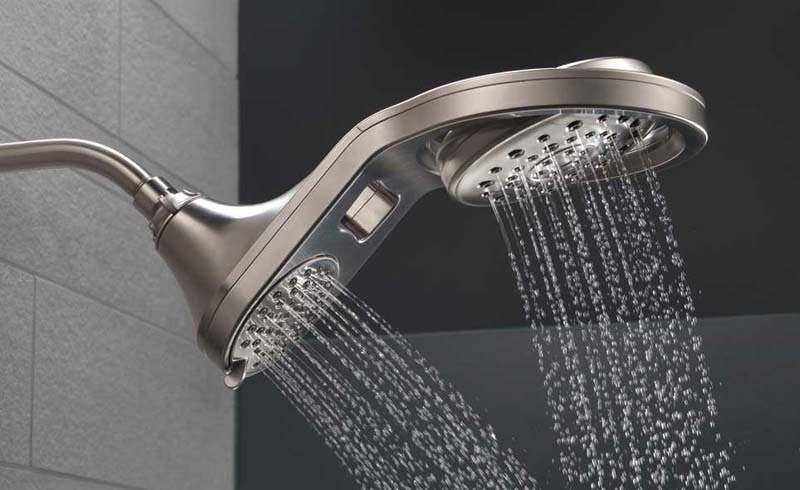 Run hot water for a minute to flush out any mineral deposits stuck inside the shower head. Scrub the fixture with an old toothbrush if buildup remains. Focus on the areas around the holes where water comes out. Turn the hot water back on to flush out even more residue. Repeat this process until you no longer see mineral deposits. Polish the shower head with a soft cloth for a finished look. 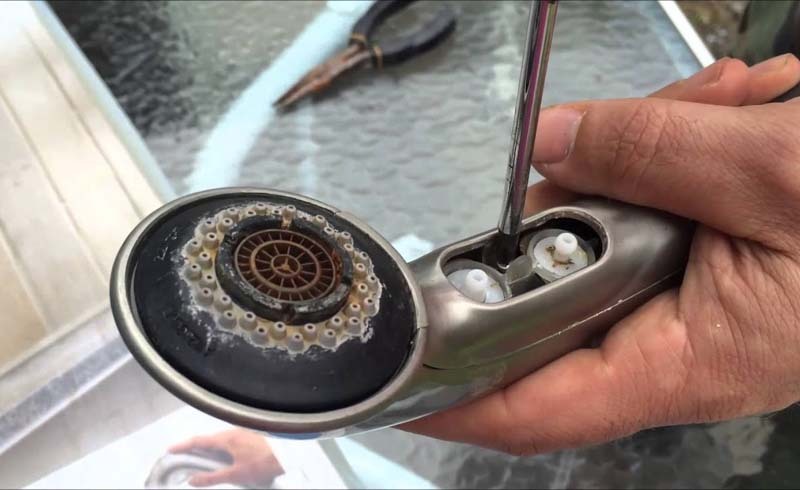 Buff and dry it to remove water spots and help the shower head look like new.